Designed to competition standard, these posts have a safe net tensioning system which allows simple transitions between heights with a further unique fine adjustment mechanism. 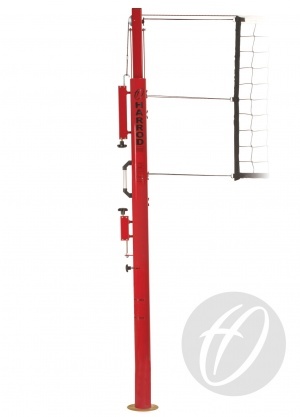 Easily adjustable to men's (2.43m), women's (2.24m) and junior (2.13m) heights. Winder and dummy posts include a unique easy to use fine adjustment screw mechanism that can be operated whilst the net is under full tension. 102mm diameter aluminium uprights allow internal mechanisms to move in harmony. 60mm x 40mm steel telescopic top upright, mounted on internal slider with an integral plunger mechanism for smooth transition to men's, women's or junior heights. Floor fixed version has a 8mm thick steel base with floor fixings and plastic wheels. Socketed version has 367mm deep sockets.